It’s back to normal today with paperwork all this morning. I’ve finally sent my claim in for the North Ayrshire Council Business Development Grant. I was awarded this a few months ago. The council heard what I was doing and came to the studio to see if there was any way they could help. I explained that we were planning to re design the website in order to help promote my work and therefore sales and they said they offered 50% grants for small businesses to help them develop their web based business. Anyone who has explored this site will have seen the changes we’ve been making and hopefully like them. It’s great to get such excellent local support and indeed I’ve just made my first sale as a direct result of the new ‘work for sale’ page on the website …so then, a good start and a big ‘thank you’ to North Ayrshire Council for their support. Anyway, yesterday we got out into the hills again …a proper hill walk – the wind was too cold to sit down and sketch. But it was a great day and I came away with many ideas for new work. 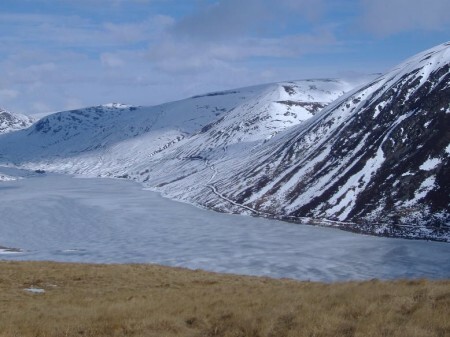 We’ve wanted to get up to the hills around Loch Turret, a reservoir situated above Crieff in Perthshire. It’s a wonderful location with high rolling heather clad hills rising on either side of the loch and the big lump of Ben Chonzie (931 m) rising beyond the far end. As we drove towards Crieff though we had our doubts as to whether we would be able to get up to the parking area by the dam …there was still loads of snow piled at the sides of the main road …it didn’t look to hopeful for the narrow road that climbs up to the dam. But we needn’t have worried, Crieff itself was clear of snow and the wee road was fine, though there was still much snow higher up. It had been an early start; I was up at 4.30am and we left Irvine at just after 6am …but it was worth while. Climbing out of the car at the dam we were surrounded by a magnificent patchwork of snow and grass and crag. It looked like being a great day. 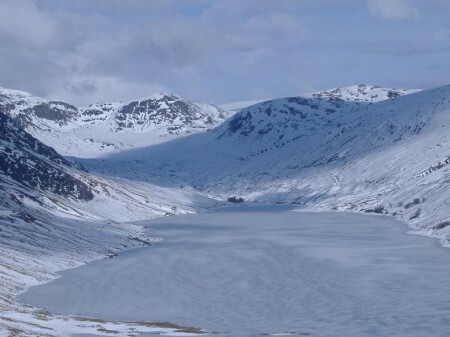 As we got to the dam and looked over we were met my the amazing sight of Loch Turret completely frozen over …it was a strange colour – a mixture of greys, pale duck egg blues and purples…wow….and we’d barely started the day. We decided that we’d not try and get to Ben Chonzie (the munro). It’s a lengthy walk to the summit and back and although we’ve done it in the past, we aren’t quite as fit at present. We decided instead to head straight up the hill side above the dam and to follow the rising broad ridge around and over Beinn Liath and on to the craggy little top of Carn Chois at 786 m. This is a grand view point from where the main bulk of Ben Chonzie can be seen. 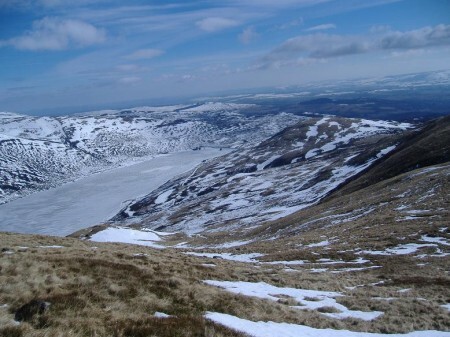 The hillsides above the dam were a complete mixture of grass, heather and snow patches. Most of the snow was quite soft lower down and so we kept mainly to the grass and heather as we clambered quite steeply up to the first little top – and what a view point it was. Overlooking the dam you could see all the way along the loch to the bigger hills …and as always happens at times like this, I got jaw ache from smiling so much …it was simply stunning. Beyond this wee top there was a slight descent and a long level curving sweep of good firm snow leading to the next bit of ‘up’. This snow was perfect for walking and being level I could stride off without my guide for a few hundred metres. Something of a rarity for me these days! As we gained height the wind really started to blow. Bad weather was forecast for the west and we could see it building up, but over Loch Turret we still had much sun shine and beautiful colours. By this stage my partner Nita had already spotted quite a few mountain hares – all still with their white winter coats. This is a great place for spotting hares and in the past I’ve even spotted a few as they’ve run from the snow onto areas of dark heather …they’re just small white moving blurs to me! That said, I missed them yesterday. At one point as we topped a rise not far from Carn Chois, we apparently scared off around 20 hares. We retraced our steps a short way back along the ridge and then descended to the loch side and a difficult walk through soggy deep snow back to the dam and the car …what a day.